This has taken a lot longer than I’d liked, but at long last we have the third Mixels review on deck. This time we’re taking a look at the last of the red ones, going by the name of Zorch. 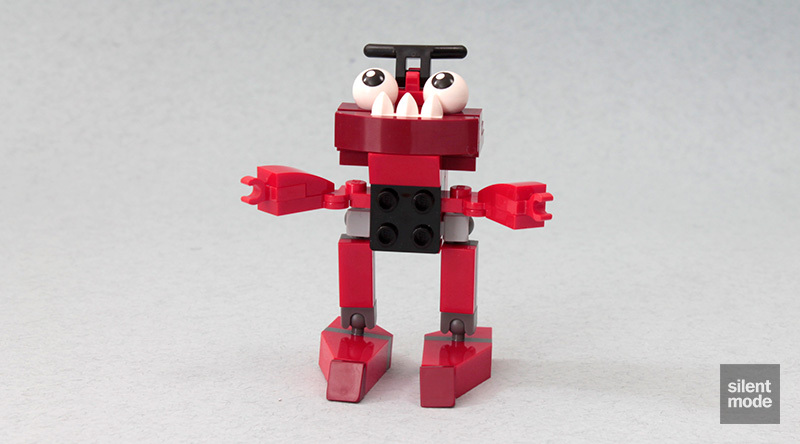 Of the three red Mixels, this one looks like the most throwaway character based on the cartoon representation. However, let’s not let that take away from the set – it does have a couple of steaming hot flames coming out of its back, after all. You may have noticed a transparent hole in the bottom left corner of these bags, outlined with a square emblem. I’m not sure what the significance of this is, but – along with the tearproof packaging – it’s one way of ensuring there are parts inside. We’re skipping the back of the packaging as it’s virtually the same as the other two sets, apart from Zorch being highlighted. As before, all the parts are arranged snugly in a smaller, transparent plastic bag, while the instructions are crisp and clean. Almost as if they’ve been ironed. Another good opportunity to get hold of those big flame parts, as well as the eye parts found with Flain and the three-tooth White plate found with Vulk. We also have a small selection of those new joint parts to play around with; we’re introduced to the long ones in Dark Stone Grey in this set, found with two other Mixels characters and three of the Legends of Chima Legend Beast sets – as well as the infamous MetalBeard’s Sea Cow, in which you’ll get three of them (instead of two everywhere else). You may not have noticed my new background, which was specially chosen to highlight White elements. You’re welcome. Unlike the previous Mixels, Zorch’s torso and head is built first. The dopey-looking underbite is capped with the Dark Red “double bow” part, while the handlebars do a great job of representing its eyebrows. The arms are constructed using Red hinge plates, which seems very restrictive but works okay. The other joints are used to give Zorch a pair of very long legs, with slightly more articulation than the other two Mixels. It turned out that Zorch was so impatient for this review to be over, it grabbed the remaining pieces and put itself together, before flexing its revving muscles. Zorch, the turbo-charged bug-like Mixel who likes nothing more than to show off its speed. ZORCH is the speediest member of the red-hot tribe of Infernites that live amid the lava near the planet’s core. 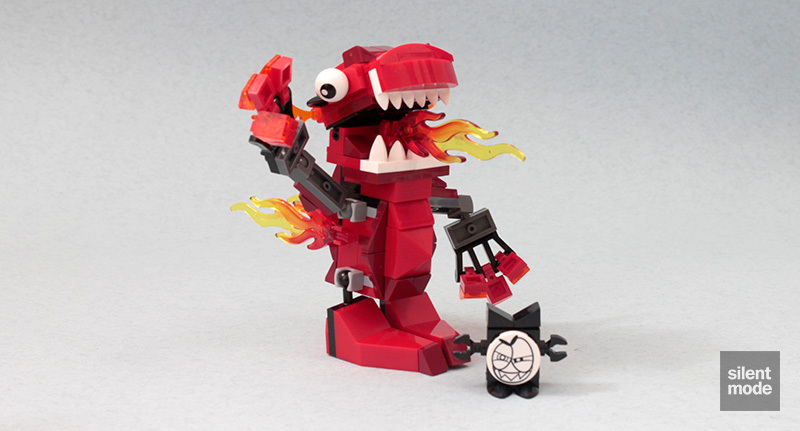 Infernites are kind of heroic, kind of bumbling… and really handy for a barbecue! When ZORCH is not playing pranks, the fiery jets from this cheeky Mixel’s backside leave Nixels standing in a cloud of smoke! Just like Flain, Zorch is left with a single “cheese” slope in Dark Red. We now know the general idea is to buy and collect all the Mixels in a colour scheme for the most satisfaction. This is Infernites Max, which is a “Max” Mixel (i.e. a result of combining at least two Mixels of the same colour) that combines all the powers of the Mixels used to form it. It will take you a while to build it if you have to disassemble the Mixels beforehand, but it’s a very interesting process nonetheless. I would personally give Infernites Max longer legs, in part for aesthetics but mostly for articulation and posing. I would also have it be able to close its mouth; what you see in the picture is about as far as it will close with the flame. Apart from those little things, I quite like the resulting model. The general idea with Mixels is that you can use the parts from the sets – and you don’t even have to stick with sets of the same colour – to create new and interesting combinations of Mixel. The official site even brings up the possibility of getting “unexpected results” by combining things that probably shouldn’t be mixed! 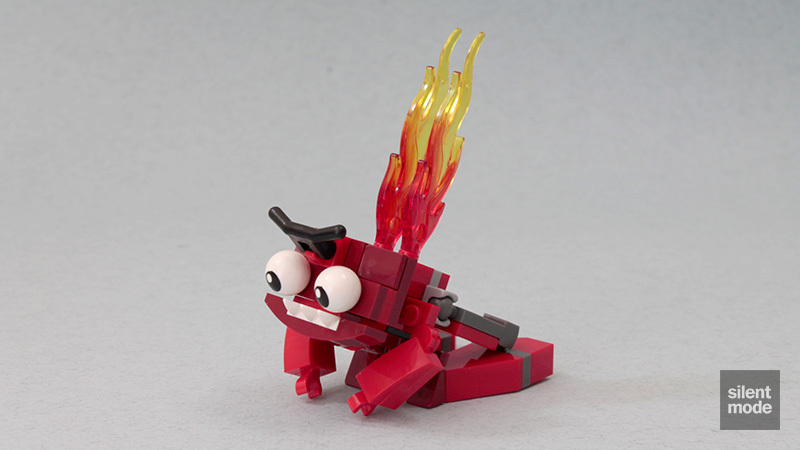 You can find the instructions for building Infernites Max over on the official LEGO Mixels website. 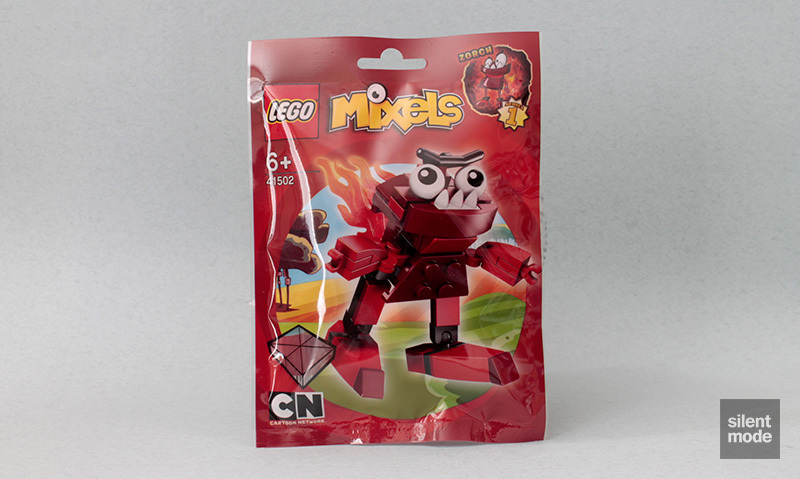 It goes without saying that each of the red Mixels on their own have their strengths and weaknesses. Zorch has those nice long legs (compared to Flain and Vulk) as well as the incredibly useful long new joints – and those eye parts, if you really want them. I’d place Zorch right between Flain and Vulk in terms of which set I’d purchase again for parts, as well as the character builds, but it probably is worth buying all three to build Infernites Max, or whatever other creation you can come up with. Let’s be incredibly boring and give Zorch 6.4/10, which you probably saw coming. In any case, that does it for the reviews of the Red Mixels. Expect to see the other Mixels in Series 1 get the belated review treatment at some point, but for now I’ll leave you with a cosy image.